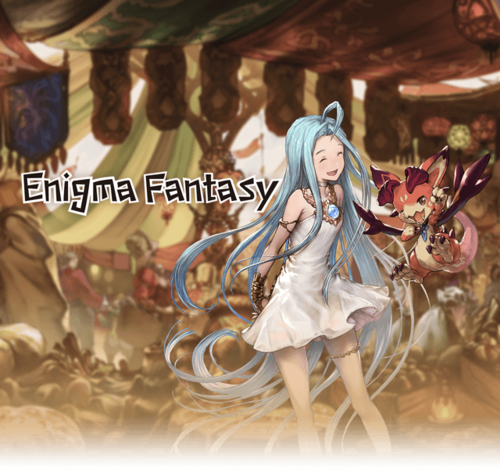 Enigma Fantasy is an April Fool's event. It was originally announced to last for only 24 hours. The event was then extended another 48 hours. The Hall of Knowledge needs your help! 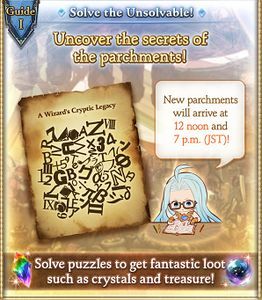 Solve the puzzles on the parchments and get fantastic loot such as crystals and treasure! 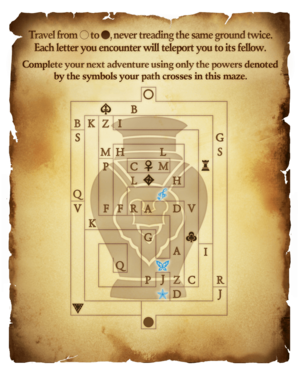 You'll get a trophy and loot such as crystals and treasure for solving each puzzle. 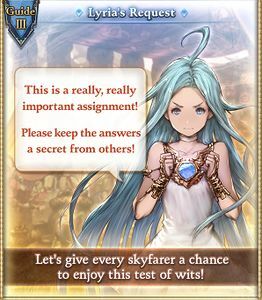 To give every skyfarer a chance to enjoy this test of wits, do not post any hints or answers on the internet, which could spoil the fun of solving the puzzles. 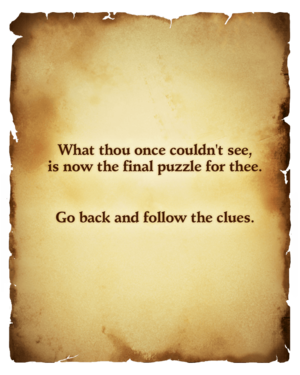 Be among the first to solve all the puzzles and get an awesome reward! 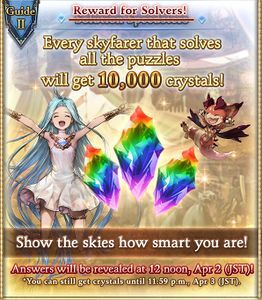 The first hundred skyfarers to solve all the puzzles will get 10,000 crystals! *We actually mean it. Not an April Fools' joke. Crystals will be sent to the Time Limit tab of your crate once all puzzles are solved. Pick them up within seven days. 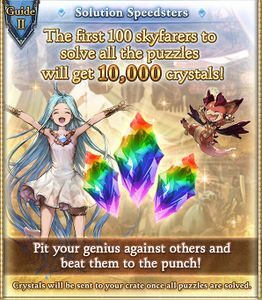 Event Update (2019-04-01): The event prize of 10,000 Crystals will be given to all players who complete the puzzles by 2019-04-03 23:59 JST. Upon completing each puzzle, you will get a trophy to verify you've successfully completed it. Remember that your current location is displayed on the top of the Home screen. If the red dragon is Vyrn, then which character is his biggest fan? 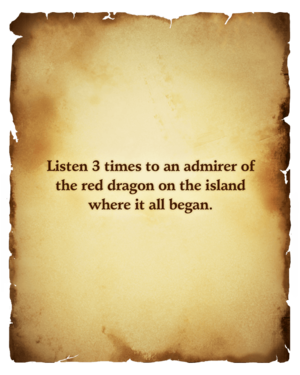 Go to the island where you first met that character, and listen to her voice three times. The island where it all began is Zinkenstill. 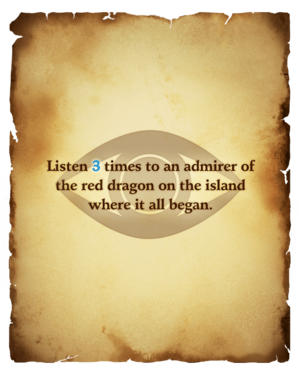 The red dragon's admirer is Katalina. Go to Zinkenstill. Include Katalina in your party, and then tap Switch on the Home screen until her image is displayed. Then listen to her voice three times. 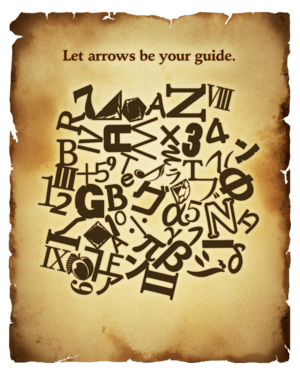 Look toward the bottom of the parchment for the following symbols: ア, F, A, L, and ■. Can you see them forming an arrow? 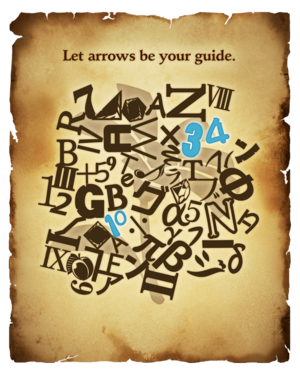 Similarly, look toward the top of the parchment for A and W.
Now start reading from the bottom arrow. The number it's pointing to is related to something you can do at the casino. The symbols ア, F, A, L, and ■ at the bottom, and the symbols A and W at the top form arrows. The bottom arrow points to "10BeT", and the one above points to "x34". You will encounter three symbols while following the path of ◯→G→Z→R→S→Q→J→●. 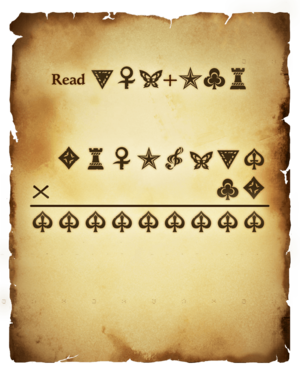 These three symbols are connected in some way to the main character's class. 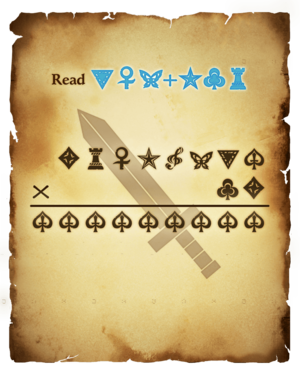 What will happen if you rely solely on this class in a quest? Going through all the symbols from start to finish, you will encounter the symbol of a butterfly, a treble clef, and a star. These are all skill icons associated with the Harpist class. Switch the main character's class to Harpist, and clear any quest once with no other characters included in the party. Try spelling out a number's color and assigning those letters numerical positions. 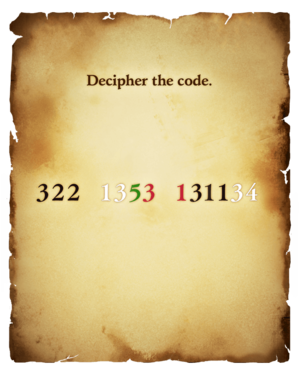 Do that for each number, and you will reveal the summon to be equipped. The first number in the code is a black three. The third letter of "BLACK" is "A." Follow this pattern for each number using their respective colors of black, white, green, and red. 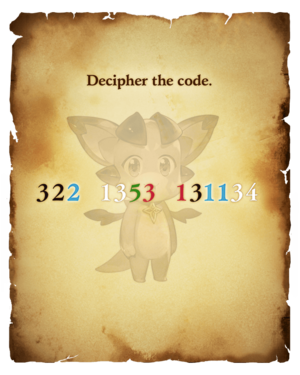 The code will spell out "ALL WIND RABBIT." Equip the summon Wind Rabbit in each support summon slot. Easy sources of Wind Rabbit are Rupie Draw or any battle on Port Breeze Archipelago (make sure to turn off summon auto-sell if it's on). The monster revealed by following this path can be found in trial battles. 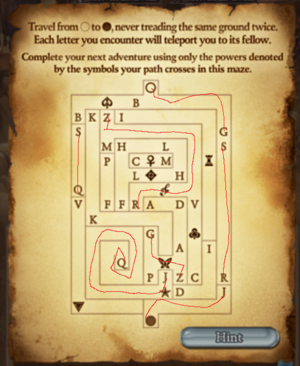 Follow the correct path through every character as instructed by the arrows. Then read every fifth letter. It will spell out "TURRET BETA 44 TURN." Start a trial battle against Test Turret Beta of any element and survive for forty-four turns. Now solve the math problem. Then you'll know which strip you want to read. Read strip #1218 of Grand Blues. Review every puzzle you have solved thus far. Notice anything different about them? The numbers have turned blue, and a watermark has appeared. Much like the solution to Decode It, the blue numbers point to their own corresponding strips. Pay close attention to how the watermarks are arranged within the strips. You're almost there! If you take a wrong turn at any point, refresh your mind with another look at the clues. 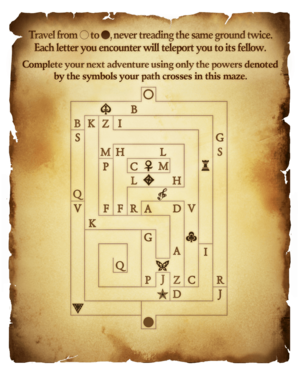 Review the previously solved puzzles. Some numbers are now in blue, and a watermark has appeared. The blue number is the strip number found in Grand Blues, and the puzzle watermark appears within the corresponding strip. Puzzle #1: Strip #3, Katalina's eye. Puzzle #2: Strip #1034, Sarunan's flower. Puzzle #3: Strip #654, bottle to Cagliostro's side. Puzzle #4: Strip #211, Vyrn himself. 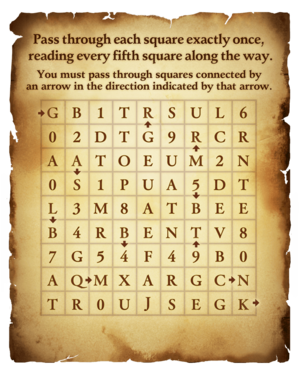 Puzzle #5: Strip #44, Cagliostro's ribbon. Puzzle #6: Strip #1218, the knife in Tanya's thought bubble. What's important to note is the exact placement of these objects relative to the panel. There is one place in the skies where the layout of its town matches the placement of these objects in the panel: Port Breeze. Travel to Port Breeze and go to the town screen. Tap the town spots in the following order: center, right, left, left, center, top. This page was last modified on 2 April 2019, at 06:06.